The Walkinshaw Grace is a premium Women’s Cart Bag. 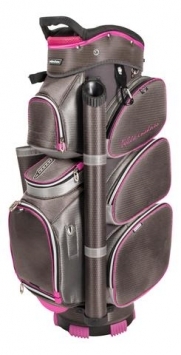 14-way top with full length dividers, external putter pit, external umbrella sheath and hideaway shoulder strap. Featuring multiple accessory pockets for all your golfing gear like cooler pocket with drainage eyelets, waterproof valuables pocket and an ultra stable base, this bag has it all. The bag also features easy-lift top and base handles, full pull-out rain coverall, GPS pocket, and is constructed from only premium fabrics.